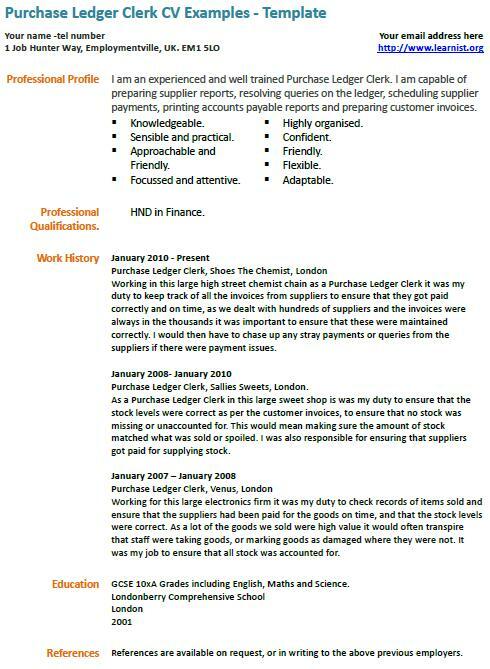 Purchase Ledger Clerk CV Examples – Template. Amend this CV example as suitable and write your own CV in minutes. This sample is free and fully editable. I am an experienced and well trained Purchase Ledger Clerk. I am capable of preparing supplier reports, resolving queries on the ledger, scheduling supplier payments, printing accounts payable reports and preparing customer invoices. Working in this large high street chemist chain as a Purchase Ledger Clerk it was my duty to keep track of all the invoices from suppliers to ensure that they got paid correctly and on time, as we dealt with hundreds of suppliers and the invoices were always in the thousands it was important to ensure that these were maintained correctly. I would then have to chase up any stray payments or queries from the suppliers if there were payment issues. Purchase Ledger Clerk, Sallies Sweets, London. As a Purchase Ledger Clerk in this large sweet shop is was my duty to ensure that the stock levels were correct as per the customer invoices, to ensure that no stock was missing or unaccounted for. This would mean making sure the amount of stock matched what was sold or spoiled. I was also responsible for ensuring that suppliers got paid for supplying stock. Working for this large electronics firm it was my duty to check records of items sold and ensure that the suppliers had been paid for the goods on time, and that the stock levels were correct. As a lot of the goods we sold were high value it would often transpire that staff were taking goods, or marking goods as damaged where they were not. It was my job to ensure that all stock was accounted for.